Free Doritos Locos Tacos from Taco Bell! Everyone ready for the Fall Classic? Tomorrow the San Francisco Giants take on the Detroit Tigers in Game 1 of the 2012 World Series. It will be a great series pitting 2 great franchises competing for the championship. 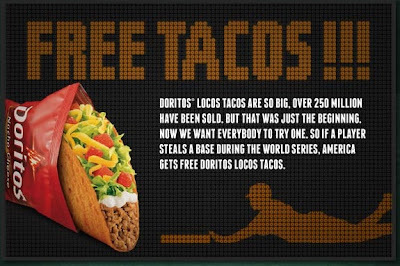 Whoever wins, everyone is a winner if someone steals a base in the World Series compliments of Taco Bell because Taco Bell will be happy to give everyone in America 1 free Doritos Locos Tacos. Go free Doritos Locos Tacos! Yo quiero Taco Bell!